. : Optics & Photonics Focus :: Light's Ring-around-the-rosey :. Laser physics and music share surprising analogies: lasers and flutes have been tuned in a very similar way until now. Recent experiments show that lasers can also be tuned in a way that does not find a counterpart in music. A knotted light beam. The complex structure of the lines of the electric field and of the magnetic field can be appreciated. Courtesy of William T. M. Irvine and Dirk Bouwmeester. Light is a box full of surprises. We now accept that light sometimes behaves more like a wave, and sometimes more like a particle. We also know that the speed of light in vacuum is always the same, regardless of the movement of the source and of the observer. However, the idea that light beams can travel not just along straight lines, but along circles may still sound unbelievable, although fascinating. Now William Irvine of New York University and Dirk Bouwmeester of the University of California at Santa Barbara have shown this to be theoretically possible, and they are on the way to demonstrate it experimentally. The propagation of a light beam is like a couple’s dance, where the partners are the electric field and the magnetic field, which twirl around each other while moving forward. As in any form of art, this dance has its rules: the electric field should always be perpendicular to the magnetic field, and both should be perpendicular to the direction of propagation. These rules are forged in the Maxwell equations. The behavior of the electric and magnetic fields is usually quite simple. Consider, for example, one of the simplest light beams: a Gaussian light beam, such as the one generated by a laser pointer. If, for instance, the beam is pointing upwards, the electric field and the magnetic field will lie on the horizontal plane; furthermore, at each moment in time, the lines of the electric field will all lie parallel to each other, and the same is true for the lines of the magnetic field. Similar behaviors can be expected even when considering more exotic beams – such as Hermite-Gaussian, Laguerre-Gaussian, or Bessel beams. However, Maxwell equations allow for more complex structures, such as the ones proposed by Irvine and Bouwmeester. 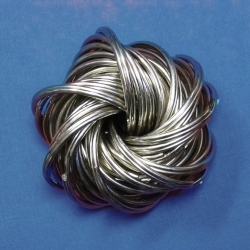 A torus of linked keyrings. Keyrings can be arranged in such a way that they mimic part of the Hopf fibration, namely some circles of the Hopf fibration which lie on a common torus. Copyright: Wikimedia Foundation. The idea behind their work was initially developed a long time ago and in a different field, the mathematical field of topology. In 1931, Heinz Hopf discovered a mathematical object, now bearing his name: the Hopf fibration . This is a deep mathematical concept that has found a wide variety of physical applications, from rigid body mechanics to magnetic monopoles and quantum information theory. The idea behind it is that it is possible to fill up the space with circles such that no two circles cross, and, in addition, each circle is linked to every other one. In order to do this, Hopf started linking circles in such a way that they formed a torus – a donut, in more informal terms. You can create one yourself using keyrings: start linking keyrings together and eventually you will get something similar to what is shown in Figure 2. Clearly, the keyrings cannot cross and they are linked together. In this way Hopf was able to fill a torus. Now, what about the rest of the space? That was easier: all the space can be filled with tori encapsulating them inside each other, as shown in Figure 3. The Hopf fibration. Tori can be embedded inside each other in order to fill the entire space. Courtesy of William T. M. Irvine and Dirk Bouwmeester. In 1989, Antonio Rañada from the Universidad Complutense de Madrid (Spain) understood that the Hopf fibration could be used to create a new solution of Maxwell equations . Now, Irvine and Bouwmeester have proposed a realistic way in which such a solution may be realized. "The inspiration came from a paper of Rañada," Irvie explains. "The main reason that pushed me to pursue this topic was pure curiosity. I have always been fascinated by the appearence of geomertical strucures in physical problems." 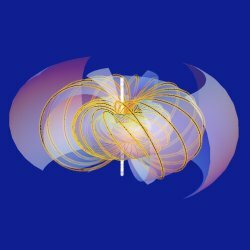 In the Irvine and Bouwmeester’s proposal, the electric and magnetic fields are two Hopf fibrations. Since the light beam has to obey the rules written in the Maxwell equations, the two fibrations are placed perpendicularly to each other, such that the electric field lines are always at right angles to the magnetic field lines. In this way, the light beam would be forced to follow circular paths. "The main difference between these beams and commonly used laser beams," Irvine remarks, "lies in the structure of the polarization. In normal beams the polarization is assumed to be 2D and not very rich in structure, while in this new kind of beams the polarization is genuinely 3D." In other words, this means that the electric and magnetic field lines can take a 3D shape and are not forced to lie in a plane, such as in Gaussian beams. "This article presents a challenge," says Antti Niemi of Uppsala University in Sweden, "and it will be interesting to see how the proposal can be experimentally verified and related to an earlier experiment . In that article, the authors reported an observation of stable knotted structures in light, originally proposed by Sir Michael Berry." And indeed Irvine is accepting the challenge, and he is now working on experimentally realizing such beams. "I am also an experimentalist, and we are now working on realizing this new kind of light beams, maybe in the microwave regime," says Irvine. "At light wavelengths it will be possible, but it is still a major technological challenge. Using a single frequency [a continuous laser beam] it should be possible to produce a pure curl state by focusing at 90º a circularly polarized Gaussian beam. Unfortunately, commercial objectives permit one to focus a beam at no more than 70º-80º, but we really need 90º. However, inputs can come from spatial light modulators or metamaterials. For a pulsed laser, things are more challenging because a very large light spectrum is needed — we are speaking of a pulse of a few attoseconds; however, it may still be feasible." Since knotted light beams have both beamlike properties and unique unexplored properties, they may find applications in many different fields. These could include applications in plasma confinement, atomic particle trapping, manipulating cold atomic ensembles, and generating soliton-like solutions in nonlinear media. "In trapping colloidal particles, for example, there is a growing interest in exploring the possibilities that arise when the full three-dimensional structure of focussed beams is considered, see for example the recent work of Bo Sun et al.," Irvine envisions. "In particular, there is interest in the possibility of the optical force having a non-conservative component, which arises when the curl of the field of force exerted on the particle by the light is non-zero. While not force-field curl eigenstates, the building block of the beams we consider have electric and magnetic fields that are curl-eigenstates. It would be interesting to carry this structure over to the force-field. Another potential, though at this stage speculative application lies in plasma physics." In Niemi’s opinion, "the idea of having knots in light as such is very exciting and could lead to many applications – maybe it is still too early to say exactly what kind of applications. Someday, if one was able to effectively create and manipulate knots of light, maybe one could speculate that there could also be a way to store and transform information in this way? Maybe one could develop some very fast computer memory? Or one could use them in cryptography, for sending encrypted information? Too early to say, but the possibilities are definitely there!" Moreover, from the very fundamental point of view the observation of knots of light can have major implications. 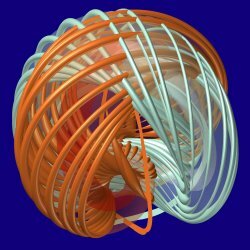 "If there are indeed stable knotted structures in light," Niemi explains, "it would be natural to expect that similar structures are also present in Yang-Mills theories that describe the electroweak and strong fundamental forces. […] So I think that, if an observation is made where one sees stable knots in light, that would also tell us a lot about the mysteries of fundamental forces that we still do not understand. It is truly exciting how so very similar ideas can appear in such different fields of Physics, and maybe help us solve problems in them!" H. Hopf, Über die Abbildungen der dreidimensionalen Sphäre auf die Kugelfläche, Math. Ann. 104, 637-665 (1931). A. F. Rañada, A topological theory of the electromagnetic field, Lett. Math. Phys. 18, 97-106 (1989). J. Leach et al., Knotted threads of darkness, Nature 432, 165 (2004). William T. M. Irvine and Dirk Bouwmeester, Linked and knotted beams of light, Nature Physics (2008) 4, 716-720 (link).